We are engaged in Supplying a comprehensive range of Conveyor Systems, belt conveyor systems, automated conveyor systems, Plastic Modular Belts, Stainless Steel Slat Chains, Thermoplastic Slat Chains, UHMWPE Wear strips & corner tapes, Drive Sprockets & Idlers, Side Brackets & Clamps and Connecting Clamps & Handles & Hinges, chair leg pads, table leg pads etc. for industrial conveyor systems. We are one of the noted supplier of a wide range of UHMWPE Wear Strips Trackes that is widely appreciated for high wear resistance and excellent sliding properties. 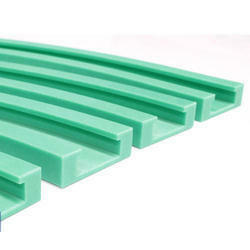 These UHMWPE wear strips, profiles, railing guides, curve tracks, belt guides, magnetic corner tracks, chain guide profiles, rope guides are the first choice of conveyor manufacturers worldwide. Our complete range of chain guide profiles and wear strips is manufactured using ultra high molecular weight poly ethylene that is procured from reliable vendors to maintain the quality of the end products. 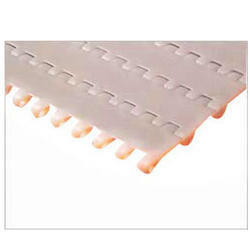 These wear strips offer low friction wear surface for chains and ensure smooth & noiseless conveying. Moreover, these are available in standard shapes & as well as in customized shapes as per the requirements of our clients. UMB-50 is a general purpose heavy duty conveyor belt which can be used for several applications including straight I conveying, Inclined Conveying, Washing Line applications, Warmers and Cooling Tunnels. Combination of 4 different top surfaces and 3 different materials make it a multi-functional, all-weather belt. We offer a wide range of conveyer frame support components that are manufactured using finest quality of material sourced from trusted vendors. The entire gamut has earned tremendous appreciation for their host of qualitative features. Available in varying specifications, our conveyer frame support components can also be customized as per the specifications provided by the clients. 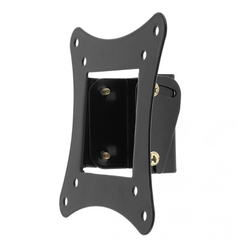 We supply variety of Side Mounting Bracket, support head, connecting joint, polyamide side mounting bracket etc at industry competitive prices. 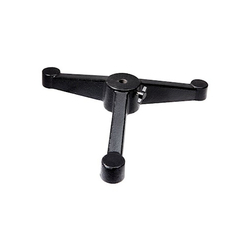 Photo Frame Support components : Our conveyer support components include support head, side mounting brackets and connecting joints. The assembly can be used to support screen assembly that displays the conveyer. Side Brackets & ClampsWe are engaged in offering a quality range of Side Brackets & Clamps that is durable and precision engineered. 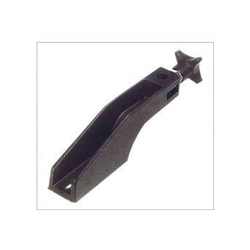 These are manufactured using reinforced polyamide and are available in varied sizes and shapes. Manufactured for diverse industry applications, our range of brackets can be designed as per the client's specification. 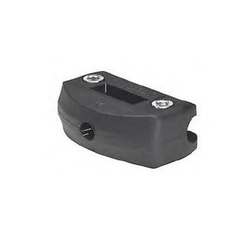 Available in black color, these guide rail clamps are offered in varied types such as guide rod clamp  single with part number USRC-5835; guide rod clamp  double with part no.UDRC-9160 and side guide rail clamp with part number USRC-9764.Our side brackets include Side Brackets, trailer side brackets and wall mounted brackets, decorative brackets etc. 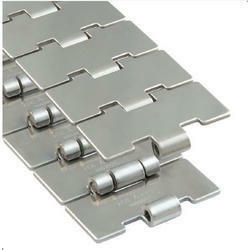 Side Flexing ChainsWe are one of the most renowned manufacturers of Side Flexing Tab and Flex Chain. 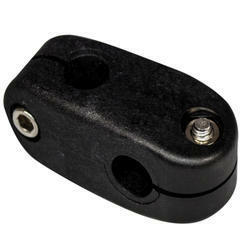 The pitch of these chains is of 1.5" (38.1 mm) and the plate thickness is of 4 mm. This chain is widely appreciated for its plain, sophisticated designing and efficiency. This chain is suitable for transporting in the industries like soft drink, beverages, bottling plant, distilleries and pharmaceutical. The system is appreciated for very easy installation, modification & changing it on site using standard tools. 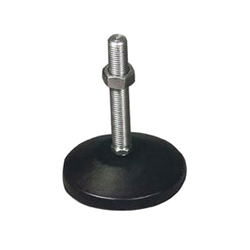 Manufactured utilizing low friction grade poly acetal material, these are available in varied types with different widths, such as ULF 880T-K325-3.25" (82.5 mm) and ULF 880T-K450- 4.50" (114.3 mm). Moreover, these are available in standard packing of 10 feet (3.048 meter). 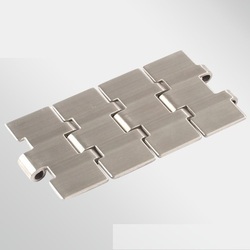 We are distributes top-of-the-line European make Stainless Steel and Polyacetal Slat Chains. These chains are available in single hinge slat chains and double hinged chains. Our range of chains including Stainless Steel Slat Chains, polyacetal slat chains, double slat chains, single hinge slat chains, is suitable for bottling plant, food processing industries, oil distilleries ,breweries , beverages and pharmaceutical industries. These stainless steel slat chains have the characteristic of straight running with pitch dimension of 1.5" (38.1 mm). The plate thickness of these chains is 3 mm that make these suitable for conveying various food products, container, bottle and packets. Moreover, the single slat chains are available in various models such as SS8I2-K325, SS8I2-K450, SS 812-K600 and SS8I2-K750 with varied dimensions of 3.25" ( 82.5 mm), 4.50" (114.3 mm), 6.00" (152.4 mm) and 7.50" (190.5 mm) respectively. Along with these, our double slat chains are available in SS 802-K750 with dimension of 7.50” (190.5 mm). Magnet FlexWe are engaged in offering a wide range of Side Flexing Magnet Flex Chains that is highly demanded in diverse industries such as food, beverages & soft drink, pharmaceutical, medical & health care, automotive & auto ancillary and packaging. These chains are attached with various material that support the elements like cross rods, slats and wire mesh. Our chains are suitable for shrink tunnels, ovens and washing machine applications. Manufactured utilizing high grade low friction grade polyacetal, these chains are available with pitch dimension of 1.5" (38.1 mm) and plate thickness of 4 mm. 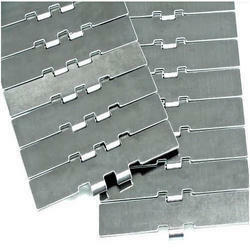 These are corrosion resistant, abrasion resistant. Moreover, these are offered in ULF 880M-K325-3.25" (82.5 mm) type. We are involved in offering Modular Belts which are largely used in various industrial processes. The offered belts are useful in various material handling equipment and are well accepted for their fine finish and providing optimum effectiveness to our valued clients. Additionally, they are fabricated by experts who use various kinds of materials to produce them. UMB-25 is a general purpose light duty conveyor belts which can be used for straight line conveying and also inclined conveying, washing, drying and drainage applications. 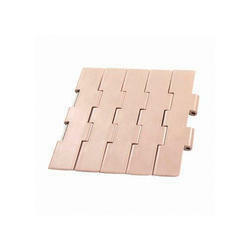 Combination of 2 different top surfaces and 3 different materials is available to satisfy diverse end use applications. Accessories include vertical flights and side walls. We offer lightweight and sturdy adjustable leg pads made of reinforced polyamide. These dynamically balanced leg pads available in black color. Drive Sprockets Since our establishment, we are engaged in manufacturing of a wide range of Drive Sprockets that are extensively used for pulling chains that can be made from plastic or stainless steel. The drive sprockets are manufactured utilizing high grade of raw material that is tested and procured from certified vendors. Our range of split drive sprocket is manufactured utilizing reinforced polyamide and is used with stainless steel chains. These sprockets are extensively used with straight running SS chains. 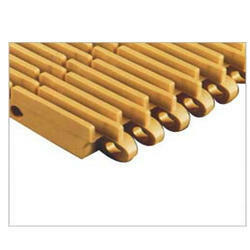 With rich industry experience, we are able to retail and supply the Slat Chain which is broadly appreciated for their durability and corrosion resistance nature. Our offered product is available in various sizes and specifications with many attachments. Moreover, we also provide the facility to customize our clients’ needs as per their exact requirements. Straight Running ChainsUltraplast Chainbelts Private Limited distributes top-of-the-line European make Stainless Steel and Polyacetal Slat Chains. These chains are available in single hinge slat chains and double hinged chains. Our range of chains including Stainless Steel Slat Chains, polyacetal slat chains, double slat chains, single hinge slat chains, is suitable for bottling plant, food processing industries, oil distilleries ,breweries , beverages and pharmaceutical industries. These stainless steel slat chains have the characteristic of straight running with pitch dimension of 1.5" (38.1 mm). The plate thickness of these chains is 3 mm that make these suitable for conveying various food products, container, bottle and packets. We are one of the leading manufacturers of a wide range of Side Flexing – Tab Flex Chain that is also known as rubber tab flex slat chains. Available in varied models such as USS 8811T-K325, USS 8811T-K450 and USS 8811T-K750; these are offered with different dimensions such as 3.25" (82.5 mm), 4.50" (114.3 mm) and 7.50" (190.5 mm). The main application of the chain is used for conveying glass bottles and is suitable for soft drink, breweries, bottling plant, distilleries and pharmaceutical industries. 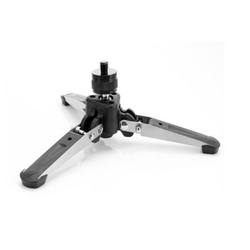 Available with single hinge-tab type, these are provided with pitch of 1.5" (38.1 mm) and plate thickness of 3 mm. Manufactured using wear resistance stainless steel, it is offered with minimum side flex radius 500 mm. We are engaged in offering a comprehensive range of Side Flexing Magnet Flex Chains that is mainly used for conveying glass bottles. The chains are primarily used in the curved conveyor sections that are fitted by magnets. 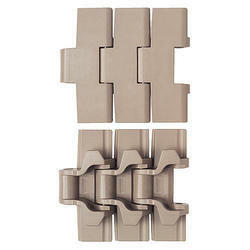 These magnet flex chains can efficiently transport products horizontally & vertically too. It helps in freeing the floor space & hence optimizes the manufacturing layout. The modular design of the chains ensures speedy assembly & dismantling of the products. 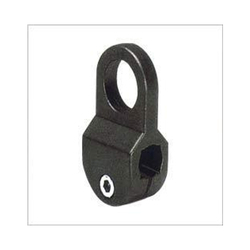 These chains are available with pitch of 1.5' (38.1 mm) along with plate thickness of 3 mm. We offer these in varied models such as USS 881 M - K325 3.25"(82.5 mm), USS 881 M -K450 4.50" (114.3mm) and SS 881M - K 750 7.50" (190.5mm) to suit the requirements of our clients. 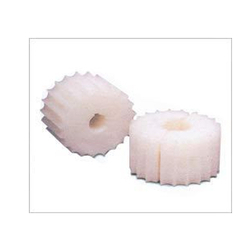 Moreover, we pack these in quality packaging material in standard packing of 10 feet (3.048 meters). Thermoplastic Slat Chains are suitable for conveying sensitive products such as PET or HDPE bottles, Aluminium Cans, Cartons, Crates etc. in Dairy, Food, Beverages and Pharmaceutical products etc. These Chains are made from Low Friction Grade Polyacetal and are characterized by smooth running and low operating noise. Thermoplastic chains are available in straight running and side flexing; both tab type and magnet flex. Relevant Sprockets, Wear strips, Comer Tracks, Slat Chain, thermoplastic slat chain, side flexing chains, magnet flex chains and guide profiles are also available. Thermoplastic Slat Chains are suitable for conveying sensitive products such as PET or HDPE bottles, Aluminium Cans, Cartons, Crates etc. in Dairy, Food, Beverages and Pharmaceutical products etc. These Chains are made from Low Friction Grade Polyacetal and are characterized by smooth running and low operating noise. Thermoplastic chains are available in straight running and side flexing; both tab type and magnetflex. Relevant Sprockets, Wearstrips, Comer Tracks, Slat Chain, thermoplastic slat chain, side flexing chains, magnet flex chains and guide profiles are also available.